This truly is the BEST 20-minute red sauce spaghetti recipe. It requires only spaghetti pasta and a good, flavorsome tomato pasta sauce. It is perfectly saucy and delicious. 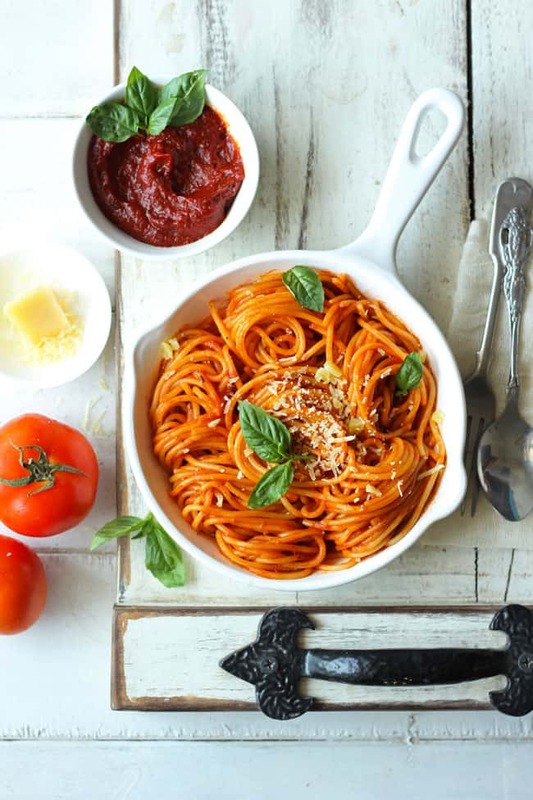 If you are looking for a quick and healthy dinner recipe then you must bookmark this 20-minute red sauce spaghetti. All you need is a nice toasted slice of bread on the side along with the plate full of red sauce spaghetti. For a cozy dinner for two of us, I am always looking for recipes that are easy to prepare, taste delicious and qualifies as healthy dinner recipe. The 20-minute red sauce spaghetti recipe rain checks all the mentioned criteria for our favorite dinner date dish. Everyone seems to have their own version of favorite red sauce pasta. So if you have a strong preference for meat or seafood or vegetables, then this 20-minute red sauce spaghetti is totally flexible. As for me? I have always fallen firmly in the camp of simple and classic red sauce spaghetti. Because it is one of my favorite ultimate comfort food. It is one of those healthy dinner recipes that I always love to share on a romantic dinner date with my husband. Like most of you, I too have few altered versions of the red sauce pasta. And I generally tend to stir in loads of roasted veggies and tomatoes like my penne arrabiata, and usually some form of protein like spaghetti with meatballs. But today I thought I’d just share the classic, base recipe for quick and best red sauce spaghetti. Most of you often ask me how to make a delicious pasta using the store bought pasta sauce. The answer to all those queries is this 20-minute red sauce spaghetti recipe. I have used Del Monte tomato and basil pasta sauce to make this tasty red sauce spaghetti. With the addition of boiled pasta water, the sauce reaches the perfect consistency to cling to the pasta. You can transform this red sauce pasta into a pink sauce pasta by using full-fat milk or heavy cream instead of boiled pasta water. Isn’t that cool? 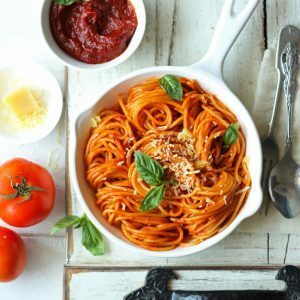 If these recipe steps are followed precisely, you will guarantee to get gratifying robust red sauce pasta in just 20 minutes. Best Healthy Dinner Recipe Ideas – Minestrone Soup, Tofu and Vegetable Stir Fry, and Whole Wheat White Sauce Pasta. For more such fun recipes in your life, follow along on Facebook, Instagram, or subscribe to our Youtube Channel. This truly is the BEST 20-minute red sauce spaghetti recipe. 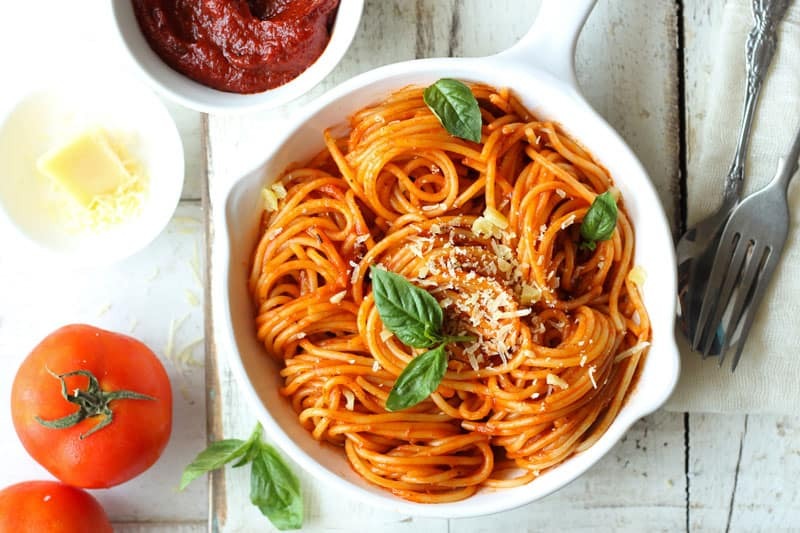 Learn how to make this red sauce spaghetti in just 20 minutes. the cooking time by 1 minute (because the pasta will finish cooking in the sauce). Reserve 1 Cup of boiled pasta water, then drain the pasta. Set aside in a metal colander. Meanwhile, heat olive oil in a large saucepan. Add garlic and onion. Cook for 2 - 3 minutes until onion is translucent. Add the red pasta sauce and quickly stir. Now add the reserved boiled pasta water. Stir to combine. Season with salt. Allow to simmer for 5 minutes. Add boiled pasta and gently toss to coat it with the sauce. Cook for 1 to 2 minutes or until the sauce has thickened and coats the pasta. Turn off the heat. Add fresh basil leaves, Italian seasoning, extra virgin olive oil and mix gently. Grate parmesan cheese just before serve. 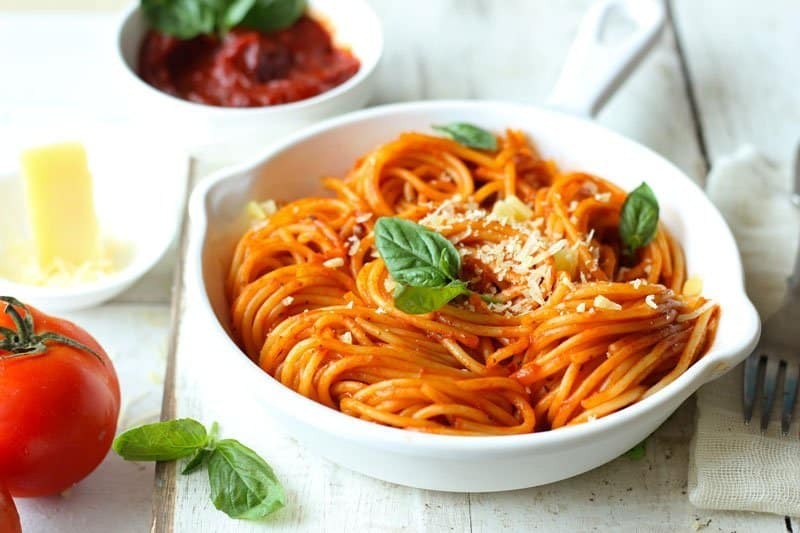 Serve red sauce spaghetti with toasted slice of bread. Any good quality readymade red sauce pasta is best for this recipe. You can add seafood (prawns, clams, squid etc) or chicken to this red sauce pasta.